Great shots Peter! To the regret of certain members of your aquiantance, I hope that you will keep on posting those beauties. For the TANAC tugs the information that I have is very little. AFOVOS for example is mentioned under Vernicos ownership until 1986. 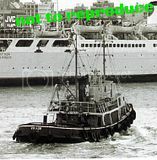 Here is the Matsas tug CYCLONE, built in 1949, she was with Matsas from 1962 to 1989. Behind her is the ferry AEGAEON (ex-ARTEVELDE). Another Matsas tug, the PEGASOS, built in 1958 as SIMSON for Wijmuller, she went to Matsas in 1983 and still around. Here is another sunken tug at pretty much the same location - at Kynosoura- with the wreck posted by Peter in post no.99. The photo dates from the late-70’s when the Typaldo’s HELLAS (ex-TAROONA) -seen behind- and her fleetmates were still laid up there. The wreck is Typaldo’s tug EFORIA (ex-PROSPEROUS, built 1942 by Cochrane at Selby for the RN). From what I have heard Typaldos had another tug named ENERGIA. Apparently they were used in Piraeus to help the company's larger ships dock. photo courtesy of the late Antonio Scrimali. Kalimeera boys, great posts ........ Typaldos did indeed have another tug, the ENERGIA (W-31 of the Royal Navy Flamer class) purchased 18-12-1964. EYFORIA purchased 07-01-1965 by Typaldos - according to my notes she was sold to Varnima in 1967 and renamed EFORIA, then in 1968 to Seka becoming CAPTAIN SPYROMILIOS (I am now wondering if this is correct) before arriving under tow at United Shipbreakers, Eleusis on 23-08-1980. I too exchanged a lot of negs. and photos with Antonio Scrimali before his untimely death and attach a couple of them. KAPPA GUARD formerly STYLIANOS K.,BULBIDER, ST-780 and DPC-80. Piraeus Port Authority O.L.P. No.1 of which I can find no info on - possibly ex ST-759/DPC-54 or ST-770/DPC-57. A bit of a ''mystery tug" competition ..... the first taken Aug.1978 and the other in Oct.1981. Unfortuneatly I could'nt get out on the breakwater, but I did get to meet, and be interviewed by, the local armed security guards ! Luckily no films etc. confiscated. The level of security was certainly an eye-opener for a lad used to the free and easy access of most NZ and Aussie ports. On my second visit I wrote in advance to the OLP but never got a reply so I was a little more cautious. With the benefit of hindsight I always wanted to return, but marriage, children (all grown up now and living in West Australia), marriage break-up etc.etc. all conspired to prevent that. Two American built wartime standards together ..... VERNICOS IRINI (ST-755) assists the C1-M vessel CYPROS to her berth at Heraklion on 31-08-1978. And another group shot, this from Antonio Scrimali in July 1990. Now Pete I don't usually bother with Lotto but this weekend I have and if I win you and Aris can come for a ride on my new tug after which copious quantitys of Fix beer and Retsina will be supplied - is this the same naval tug A409 in your post No.82 ? Seriously though she would make a great addition to the HELLAS LIBERTY considering the large number of US tugs which saw service in Greece after WW2. Should I go buy the beers? Did you won? Anyhow, this is indeed the same tug as in post #82. It is the former Greek Navy tug ACHILLEUS (ex-ENGELADOS, ex-HMS CONFIDENT) which was built in 1942 by Gulfport Shipbuilding Co., Port Arthur, Texas. Indeed, it would be nice to see one of those veterans next to Hellas Liberty, although the big opportunity was when the veteran AGHIOS GEORGIOS (posts 122 and 126) was scrapped in 1996. Peter, I do have the same information on EFORIA and I do also wonder if it is correct. I have tried to find out the identity of the wrecked ship which bears the Typaldos' logo. It is not one of their passenger ship and I suspect one of the two tugs. Recently I was pointed to EFORIA but I need to verify it somehow... It could be thought that EFORIA was indeed sold but might have not left the moorings and eventually foundered only to be raised and scrapped. Antonio was a "usual" in the backwaters of Piraeus, coming allmost every year, and I am sure that he is missed by many shiplovers. A bit of a ''mystery tug" competition ..... the first taken Aug.1978 and the other in Oct.1981. Unfortuneatly I could'nt get out on the breakwater, but I did get to meet, and be interviewed by, the local armed security guards ! The dock was filled with all short of vessels in any possible condition. Attached are a couple of shots taken. In the first shot, at the left is LEON with another couple of tugs and at the right is Matsas' ALKYON. At your second shot of the breakwater, at mid right, I can make out the veteran AGIOS GEORGIOS with the ungly rectangular built before her funnel. Two shots taken in 1963 next to the charred hulk of Chandri's BRITANNY. In the first shot I think that the tug at the right is PIRAEUS but I cannot make out the name of the on at the left. In the second shot is a partial of VERNICOS FRANGISKI. A nice little Tsaviliris tug, NISSOS ITHAKI. She was built in 1922 and operated for Tsavliris in 1969-73. Any addittional information will be more than welcomed! Great series of shots of those older tugs Aris. Info on the NISOS ITHAKI is scarce and all I can add is that she was built for Cie. Chambon, Marseille as MARSEILLAIS 11 and later renamed MARSEILLAIS 12 for some reason, and in 1969 sold to Tsavliris. In your other post the tug alongside PIRAEUS is the AGHIOS NICOLAOS II, built 1924 by J.P.Rennoldson & Sons Ltd; Shields, England for Les Abeilles of Le Havre as ABEILLE 20. From 1940-45 she was requisitioned by the Royal Navy, and after being returned to Abeilles was sold to Matsas in 1957. Completed as a steamer she was converted to diesel at some stage (wether by Abeille or Matsas I have been unable to ascertain). The funnel of the other tug with the N on the funnel is interesting and, I am sorry to say, I have been unable to identfy it ! Hope this is of some help, regards, Peter.